Fashion Stork is another in the line of men’s clothing subscriptionservices that have popped up in the age of smart phones and mass customization. 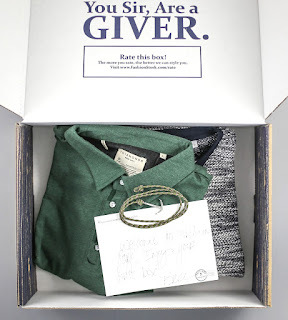 Like Trunk Club and Five Four, Fashion Stork efforts to put men who don’t like to shop, or don’t have a strong fashion sense, into clothing they can wear proudly and confidently to work or out on the town. How Does Fashion Stork Work? For $75 per month (or $77 every 60 days, or $80 every 90 days), Fashion Stork will send two to four items that a stylist has chosen for you based on the style and size information you provided upon sign-up. The Fashion Stork website advertises 365 Day Exchanges for items you do not want, and you may also cancel the service at any time. There is no long-term commitment necessary. Each package includes clothing items and accessories that are designed to go together, and can also be used with other pieces in your closet. Each package is unique, and is filled with “quality items from brand names and private labels.” The type and quantity of items in each package varies depending upon the membership level you have chosen. Staples such as shirts, shorts, pants, ties and jackets…And a wide variety of accessories like shoes, ties, belts, suspenders, watches, sunglasses and hats (to name a few). Of course, any company’s website will shine a positive light on its business plan and humanitarian efforts. But the true test of a business’ mettle is customer reaction. I wanted to research Fashion Stork myself, and the reaction is mixed, at best. In some of the more positive reviews, customers report that Fashion Stork stylists adhere to color and style requests, and that the clothing is fashionable and well-made, but can be off on more minute details that might not come to light in the original questionnaire. For example, a customer preferred ¼ zip sweaters, but the Fashion Stork stylist sent a V-neck. Not an egregious error, but considering the service is designed to create unique packages customized to the individual, it seems like the initial questionnaire should cover this detail. Another customer reported a far more negative experience with Fashion Stork. He sent a message to the company through the website’s contact form that his favorite color was a scarlet or bright red, and in the first package they sent a wine-red polo shirt. The customer also noted that he disliked polo shirts. In addition, he said that the package included a cheap belt that looked like it was made to be a child’s toy. That same customer reports that he tried to contact customer service and the email bounced right back to him, and that he still hadn’t heard back in the following 24 hours. As you might expect, he did not recommend Fashion Stork to others, and instead recommended men selecting their own clothing at the mall or a website like www.gilt.com. But to be fair, I wanted to try the service out for myself. I completed their online profile, which was rather extensive. In addition to size information, I was able to give preferred colors (and colors I don’t like), styles I like and don’t like, and then some room to type information about myself which would help my stylist complete outfits for me. In addition, I was able to select brands I normally shopped, again, to help the stylist learn more about me. I received my first package within three weeks, (which was a little longer than I would have hoped) and I have to say -- I like what they sent…. The shirt and sweater matched my color and style profile, and socks that really popped with the outfit. The issue is I was able to find these clothes online for a lower price and the items were out of season. While it is possible to find positive reviews and feedback about Fashion Stork, and also from my own experience, there is far more evidence that the clothing is overpriced and not at the level of quality advertised or in the styles that the customer requested. All in all.....I’m medium warm on this company at best. For those of you that want to try your luck, I encourage you to have your own experience at www.fashionstork.com -- Make sure you share with me what you thought of the service... I always want to hear what others think.